What can I say about this sandwich, except NOM NOM NOM NOM NOM ? Ok, I can say a bit more: it’s perfect for summer because you don’t have to turn on the oven. It’s got a curry/mango kick. It takes advantage of all that fresh arugula that’s available right now. And it’s freakin’ delicious. So, to reiterate: NOM NOM NOM NOM NOM. In a medium bowl, whisk together the yogurt, chutney, lime juice and curry until blended . Add the shredded chicken and scallions and toss well. Season with salt and pepper. 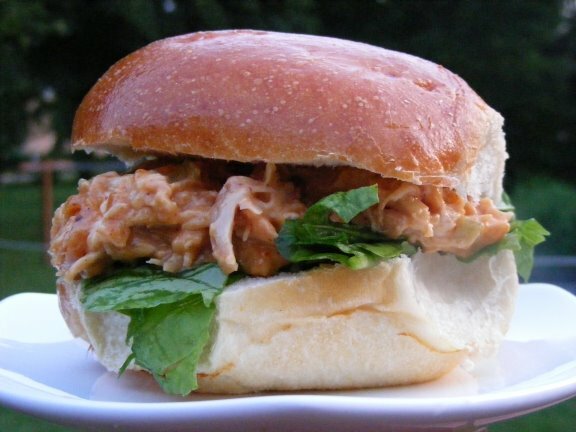 Place arugula on the rolls, top with the pulled chicken salad and enjoy.